Wednesday night was book club, with an evening of dense fog and a light drizzle after a day of welcome rain. I always bring something homemade to our gatherings, and try to make it gluten and dairy-free for one of our members. 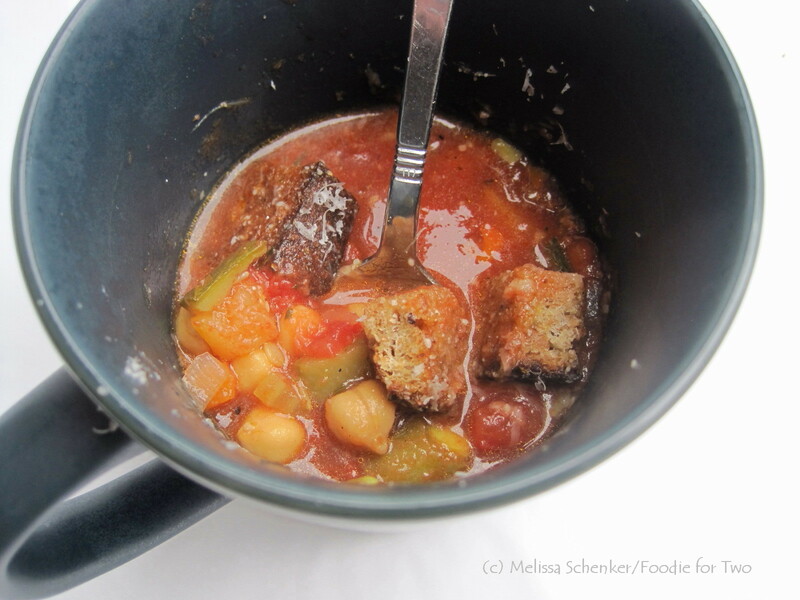 After taking stock of what was in the house, I discovered that I had everything to make a vegetable soup – perfect for our mountain weather! While it takes some cooking time, it is easy to put this soup together. It is chock full of fresh vegetables (carrots, onion, celery, zucchini, yellow squash, snap peas) and has a delicious, rich and chunky tomato broth. Typically, cooked pasta is added to vegetable soup, but I used garbanzo beans (chickpeas) because of their great flavor and nutritional value – they were a big hit. This is a versatile recipe and even better with spinach; had there been some on hand it would be in the soup. Other substitutions are frozen vegetables, or angel hair or ditalini pasta (Mary and Nada enjoyed their soup with a bed of angel hair pasta). A flavor secret: the longer cooking time allows for a parmesan rind to melt into the soup, giving it a rich deep base. This batch was sans the cheese rind for Sybil, and grated parmesan cheese was served on the side. What books have we been reading, you ask? Wednesday night we discussed “Someone Knows My Name” by Lawrence Hill, which was September’s selection. And for October, we are reading “Unbroken” by Laura Hillenbrand. For more information about these thought-provoking reads, click on each image. One of the benefits of being in the kitchen: The cook always gets to do a taste test! And of course I had to make something crispy to top the soup – a whole grain boule from our freezer was the perfect candidate for some homemade croutons. They are so much better than store-bought and only take a few minutes to make. Any type of bread will do and I use my trusty toaster oven for the task, but the broiler will work just as well. If the bread is frozen and you have a paper sandwich bag, it can be harmlessly defrosted in the microwave (see recipe for details). For salads, the croutons are even better if you brush the bread with your favorite vinaigrette recipe – the same as what you are using to dress the salad. 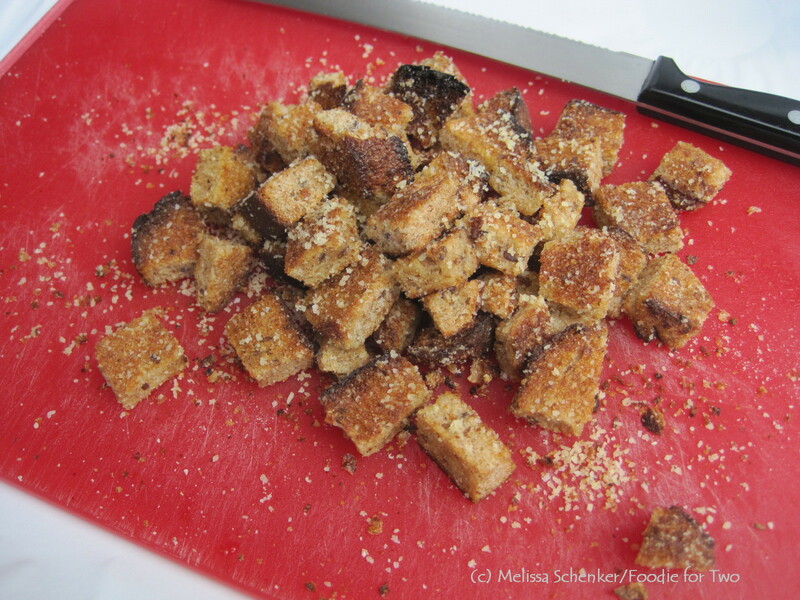 Along with some freshly grated parmesan cheese, the croutons are a delectable garnish. What good books have you read lately? We’re always looking for interesting novels to read, so please leave a comment and pass on any of your favorites. I would love to hear your thoughts. I am hosting book club next month and look forward to sharing the love, direct from my kitchen! In a 6-quart Dutch oven, add 1 tablespoon olive oil and heat over medium-low heat. Add the vegetables along with the herbs de Provence, ¾ teaspoon salt and a good pinch of pepper; stir well, cover pot with the lid and sauté for 30 to 40 minutes, stirring often, until vegetables are soft. Add the minced garlic, stir well and let cook for 1 minute. Stir in the tomatoes, vegetable broth (or water) and garbanzo beans along with ¾ teaspoon salt, another good pinch of pepper and the parmesan rind or piece of cheese. Increase heat to medium and let simmer gently, uncovered, for another 1 to 1½ hours. Croutons: Brush both sides of bread with olive oil, season lightly with salt and pepper, toast or broil until both sides are lightly golden. Rub one side with the garlic clove and dust both sides with grated parmesan cheese. Return slices to toaster oven or broiler and toast again until both sides are golden brown, let cool slightly and cut into bite-size pieces. Serve the vegetable soup hot, and garnish with a few croutons and some freshly grated parmesan cheese. * Croutons – To defrost frozen bread in the microwave: Place bread in a paper sandwich bag, fold down top to close and microwave (on half power) for 1 minute increments until just starting to defrost, about 2 minutes for a whole boule. Use a serrated knife to cut into slices. More vegetables to add, fresh or frozen: Bell Pepper (red, yellow or orange), Green or Yellow Green Beans, Steamed or Blanched Cauliflower florets, Spinach (add with liquids). 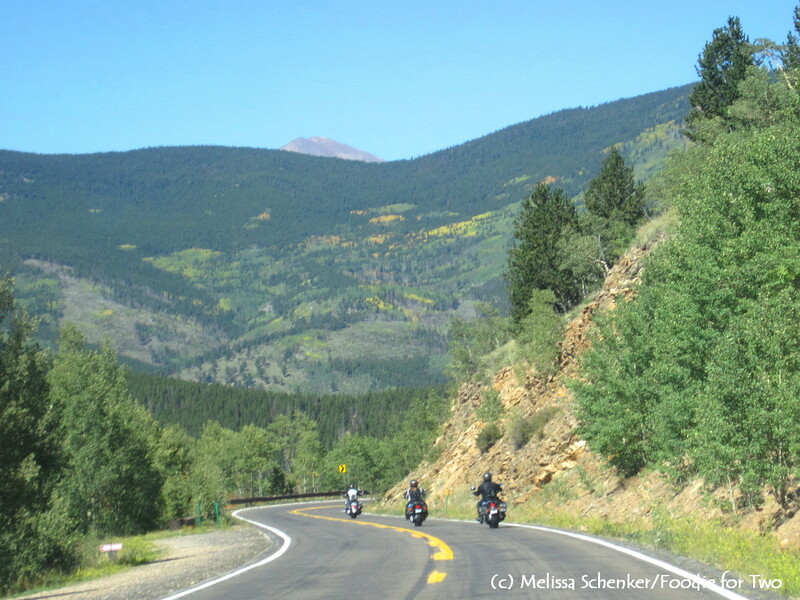 Last Sunday we took a drive to see the changing colors of Fall……. 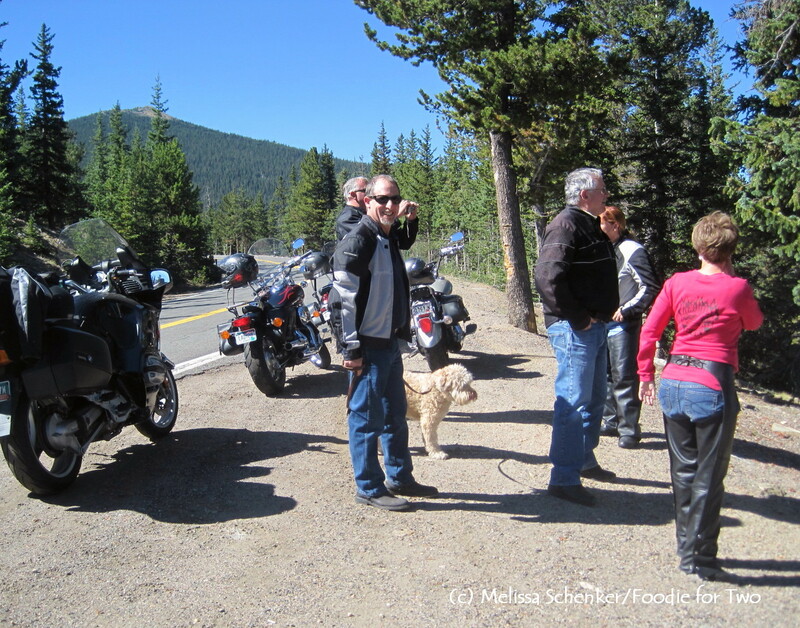 Murphy and I followed in the SUV (I imagined it was a Porsche 911 while driving through the curvy mountain roads, keeping up with the bikes) while David and friends rode their motorcycles through some of Colorado’s high passes. 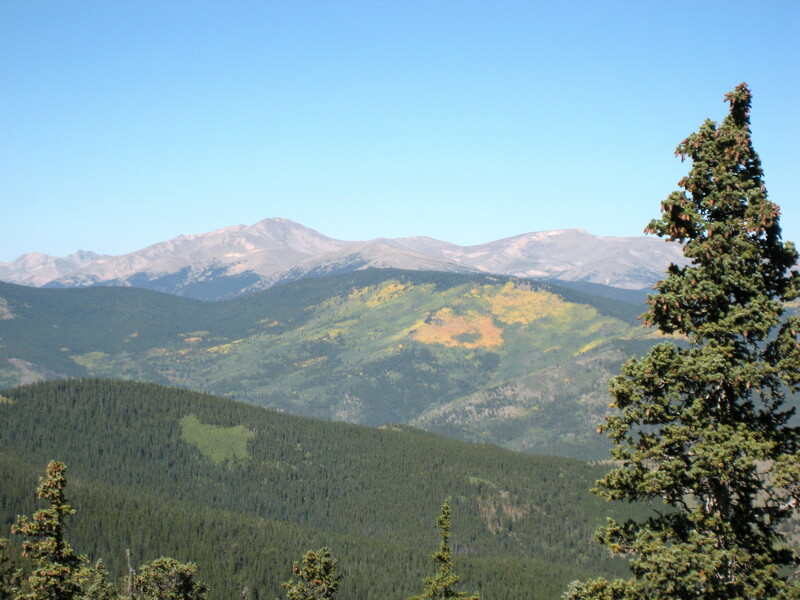 It’s beautiful here! With some cold weather (we have snow in the forecast tonight!) 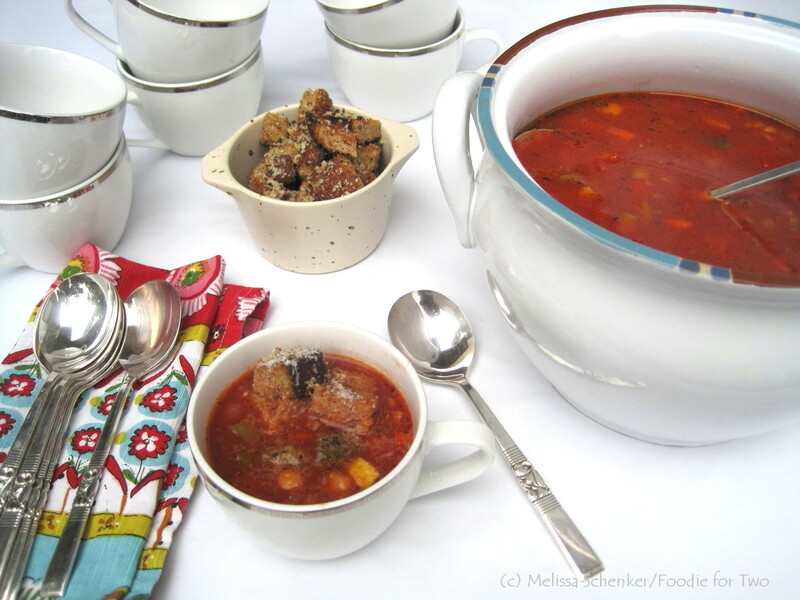 settling into our area, it’s the perfect time to make a heartwarming soup. 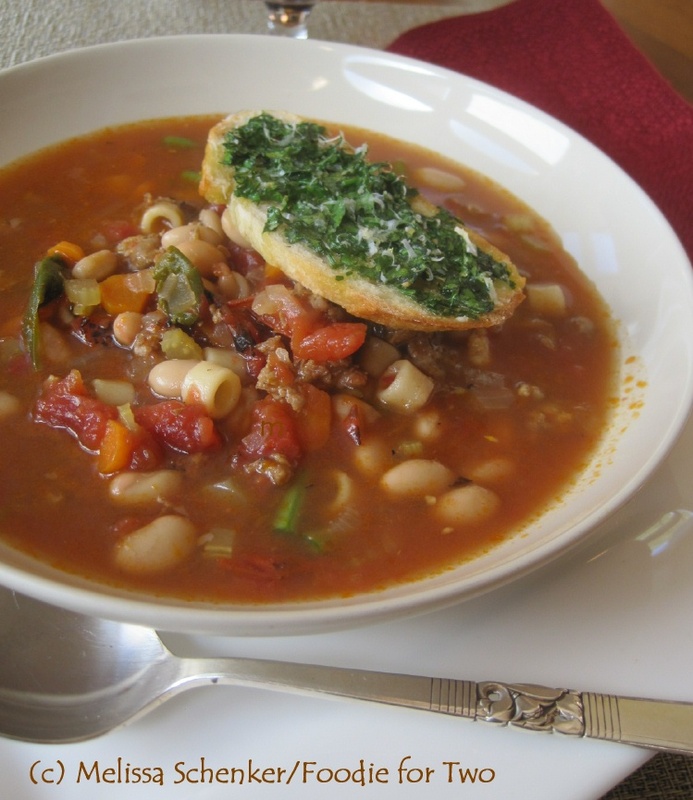 Minestrone is a classic Italian soup and has many variations, usually made with meat, vegetables and pasta. This recipe is easy to put together and has tons of homemade flavors. It starts with sweet Italian sausage and is built with sautéed onions, carrots and celery, and then fire-roasted canned tomatoes, beef stock, a bay leaf and a parmesan rind (see my tips & hints) are added for a rich, deep flavored broth. It simmers for 45 minutes to three hours – the longer the better, which also gives the parmesan rind more time to melt into the soup. Ditalini pasta (small tubes), cannellini beans, green beans and baby spinach finish off this rich and satisfying soup. In my book, a savory crouton is a great way to dress up a bowl of soup; a flavorful gremolata mixture makes a delicious crouton topping to enjoy with the minestrone. The croutons are simple to make with just a few ingredients. A gremolata is traditionally made with parsley, garlic, olive oil and lemon zest; I have added parmesan cheese to give a little crispy crust when the croutons are toasted. 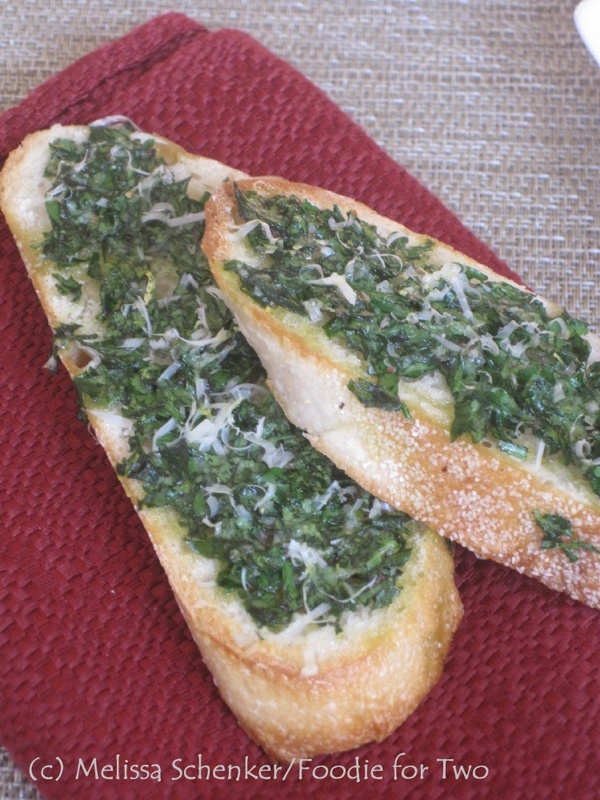 Slices of bread are lightly toasted, a garlic clove is rubbed on the bread, it’s topped with the gremolata and toasted until lightly golden. For a pre-dinner nosh another time, you could enjoy these croutons on their own (or with some good prosciutto, thinly sliced) with a glass of your favorite wine, or cocktail. If you prefer, a flavorful turkey sausage can be substituted for the Italian sausage. And if you are gluten-free, omit the pasta. I hope your dinner table will soon include some heartwarming bowls of minestrone soup and unforgettable croutons. Cheers. In a 4 or 5 quart Dutch oven (or medium stock pot), heat to medium and add a few drizzles of olive oil so the sausage won’t stick to the pan. Add the sausage and cook until crumbled and browned, about 20 minutes. Turn off the heat and transfer to a plate lined with paper towels. Wipe out the pan. Return heat to medium-low and add 2 tablespoon olive oil. 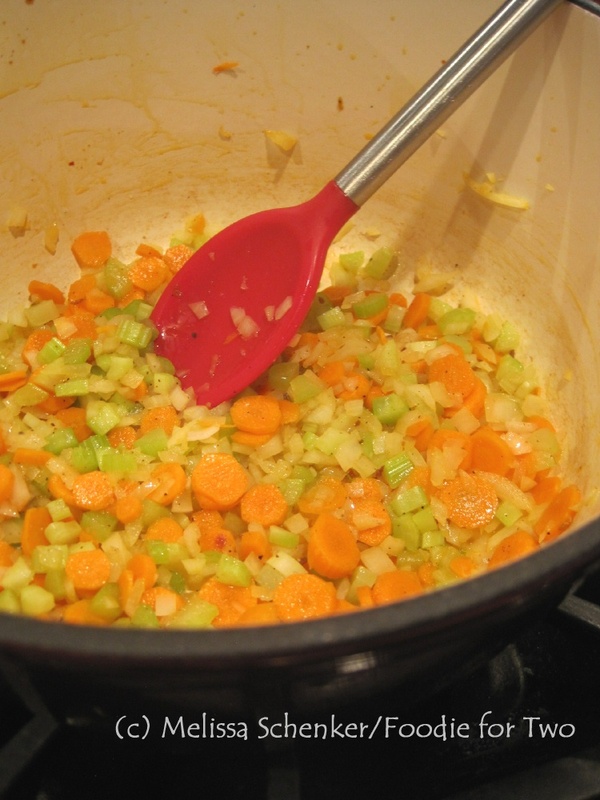 Add the onions, celery and carrots with ½ teaspoon salt and 1/16 teaspoon of fresh-cracked pepper; sauté, stirring often, until vegetables are soft and tender – about 20 to 25 minutes. Add the garlic and let cook for 30 seconds, stirring constantly. Add the canned tomatoes, 4 cups beef stock, the bay leaf and the parmesan rind. Let simmer on low heat for 45 minutes to 3 hours. About 30 to 45 minutes (45 to 60 minutes for high altitude) before serving, stir in the pasta, spinach, cannellini beans, chopped green beans, ¼ teaspoon salt and a few grinds of fresh-cracked pepper; let simmer on medium-low heat until pasta is just tender. If needed, add more beef stock to thin out. Serve soup hot with gremolata parmesan croutons (recipe follows). In a small bowl, mix together the parsley, olive oil, lemon zest, parmesan cheese, salt and pepper. In the toaster oven or under the broiler, lightly toast croutons and then rub with the garlic clove. Drizzle with olive oil and lightly season with salt and pepper. Add 1 ½ teaspoons of the gremolata mixture to each crouton and spread out. Top with a light sprinkle of parmesan cheese and lightly toast until bread edges are golden and mixture is warmed through. Serve warm.